In this monograph the author relates findings from more than 30 years of experiences and observations with Bufo alvarius and 5-methoxy-dimethyltryptamine, in various user groups and individuals, both in the US and in Europe. The term underground is used in referring to the explorations with these substances, in the sense that they were hidden - out of respect for the restrictions and prohibitions of mainstream culture. These are ethnographic field reports, first-hand observations from an underground sub-culture, accompanied by the experiences of a selected number of participant-observers. It is important to recognize that in research with these and other so-called psychedelic or entheogenic substances, one cannot limit the observations and reflections solely to their physical and psychological effects. As most of the people cited here emphasize, the experiences with these substances at times can go far beyond their physical and psychological effects into the deepest and highest dimensions of our existence, both the cosmic and the spiritual. 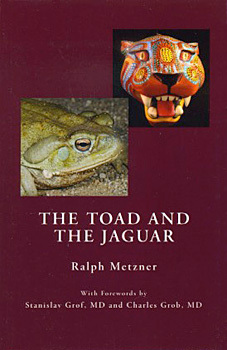 Ralph Metzner, Ph.D., received his undergraduate degree at Oxford University and his doctorate in clinical psychology at Harvard University, where he was also the recipient of an NIMH Post-doctoral Fellowship in psychopharmacology at the Harvard Medical School. He collaborated with Timothy Leary and Richard Alpert in the studies of psychedelic drugs and co-authored The Psychedelic Experience. He is a psychotherapist and Professor Emeritus at the California Institute of Integral Studies, where he taught for 30 years. He has a life-long interest in the many different realms of consciousness and its modifications. He is the author of The Well of Remembrance, The Unfolding Self, Green Psychology, Birth of a Psychedelic Culture (with Ram Dass); editor of two collections of essays on ayahuasca and on psilocybe mushrooms; and author of a new series of seven books on The Ecology of Consciousness.